Your printer software for Windows automatically checks for updates to the product software. You can change how often the software checks for updates or disable this feature. Access the Windows Desktop and right-click the product icon in the Windows taskbar. 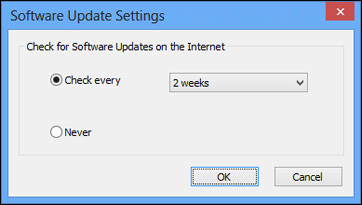 To change how often the software checks for updates, select a setting in the Check every menu. To disable the automatic update feature, select the Never option. Note: If you choose to disable the automatic update feature, you can check for updates manually.